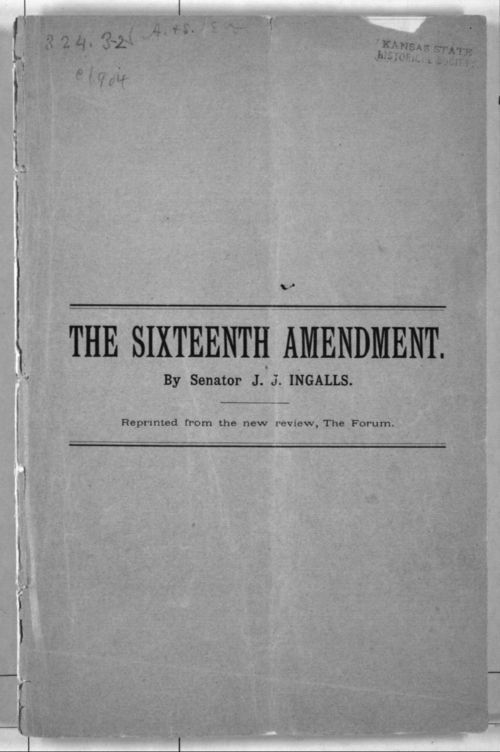 Senator John James Ingalls was serving in the U. S. Senate when he wrote this article about the Sixteenth Amendment that would give voting rights to women. He offers a number of arguments about why women should not receive suffrage. He argues that the case for women is very different than that of African-Americans because he believed that the consent of the governed was based on the ability of the governed to impose law by force if necessary. He did not believe that women would be able to do this. He also cited statistics from Massachusetts that he felt showed a lack of interest on the part of women in voting. He closes the pamphlet by writing that "Whenever woman wants the ballot and society needs her enfranchisement, then the sixteenth amendment will be adopted." This pamphlet was a reprint of an article that was originally published in The Forum, New York, New York. Government and Politics - Federal Government - Congress - Senate - Ingalls, John J.